In the conclusion of parshat Mishpatim, bnei yisrael exclaim the famous words, na’aseh v’nishmah (24:7). The Kli Yakir explains what prompted bnei yisrael to declare their words of dedication: Originally, bnei yisrael thought that the 10 Commandments was all that Hashem would mandate to them, but once they saw Moshe place half the blood in containers and sprinkled half on the mizbeach, they presumed that more commandments would follow and only then Moshe would sprinkle the remaining blood onto the mizbe’ach. Therefore, as a sign of eagerness, bnei yisrael said, “na’aseh v’nishmah,” that even without hearing the additional mitzvot, they would keep them. This idea brings out the love and faith that bnei yisrael had for Hashem. However, if we focus on their words, an unattainable goal surfaces. Practically speaking, even someone who is very zealous and excited to do a certain job, first must find out what that job entails. Someone can agree to do a job without knowing its details - this would express a zealousness to do the job - but it is impossible to actually do the job before knowing what he is meant to do. And yet, this is exactly what bnei yisrael said they would do; they said they would keep all of the Torah without even have being given all of the Torah! How is it possible to do something without being told what to do? In order to develop an understanding of bnei yisrael’s seemingly impulsive decision, we look to the Maharal. In introduction to his sefer Netzach Yisrael, the Maharal teaches that anything which leaves its natural state will, in time, return. He explains how the Jews natural state is in Eretz Yisrael and therefore one should realize that the final redemption must come in order that the Jews return to their natural habitat. Similarly, a Jews natural state is to be serving Hashem. Therefore, if one is struggling with a certain taiva or mitzvah he should realize that it is just a temporary struggle, for the Hashem’s natural world dictates that every Jew will return to his Maker. A Jew’s nature is to serve Hashem. Similarly, in one of his many seferim, Adar HaYakar, Rav Kook explains that keeping the Torah is so much an innate part of a Jew, that if a Jew were to tap into his higher self, even without knowing what the Torah was, he would naturally connect to the Torah and its mitzvot. 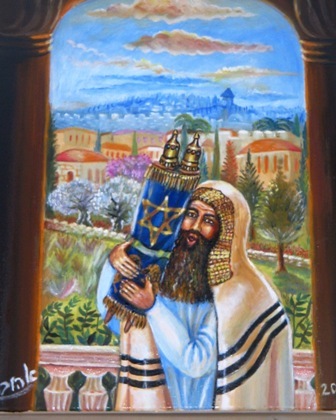 The Torah is so much a part of him that, if he permits himself, he will naturally follow Hashem’s commandments. With this realization of a Jew’s nature we now understand how bnei yisrael could exclaim na’aseh v’nishmah. Their excitement to serve Hashem wasn’t a premature, impulsive outburst, rather they already knew innately what Hashem would require of them. They had all of the Torah’s ideas born within them, they just had to express it. All they needed to do was take the Torah that was already deep inside of them and bring it out. The idea that a Jew naturally wants to keep the Torah is a fundamental concept to stay afloat of life’s inevitable challenges. When one sees himself going off path, he should not become distressed, rather he should always remember that Hashem created this world governed by natural forces; among them, that a Jew will always return to his Creator. The Maharal brings a couple examples of created nature: if one were to try to keep a fire from flaming up into the sky it would stay down for a moment, but it will spring back up quickly, for it is unnatural for fire to stay low. Or if he would try to throw dirt up in the air; it will fall back down to the ground, to its natural state, due to gravity. For this is the nature that G-d has created. The same is true with a Jew. The yetzer harah can try to make us do things which rebel against Hashem. But that rebellion would be rebelling against our very nature. Hashem created us in a way that we naturally want to cling to Him. Therefore, one mustn’t get down on himself, for Hashem created the world in such a way that no matter where a Jew goes, he will come back to his natural state of following Hashem and His ways. Perhaps this is what is meant by the pasuk rabot machshavot b’lev ish, v’etzat Hashem he takum - many thoughts are in man’s heart, but only the will of Hashem will prevail (Mishlei, 19:21). Man may have many conflicting thoughts caused by his yetzer harah but he shouldn’t worry for G-d’s conviction will remain. Due to the nature with which G-d formed the world, man will always return to his Maker. King Shlomo is telling man not to worry and to always think positively for even if he is confused at the moment, the natural, na’aseh v’nishmah state of a Jew will ultimately come to fruition and bind him to Hashem.